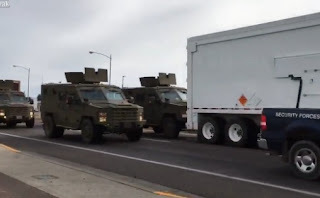 "Have you ever seen a nuclear missile being transported in a convoy? Several helicopters in the air and federal marshals leading the way. The crazy thing is that the fed pulled over and was yelling and waving his hands that I can't record this video! And then a truck rear ended the nuke!"